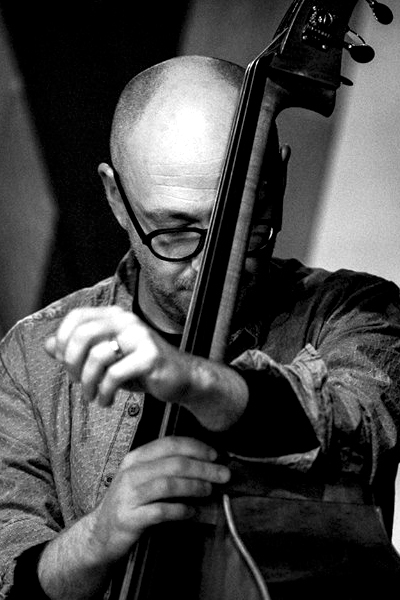 Living in Nantes where he jointly runs the Yolk Records label, Sébastien Boisseau has become a reknown double bass player in Europe. He develops a powerful and elegant playing, his references are anchored in jazz, somewhere between Jean-François Jenny-Clark, Marc Johnson and Scott Lafaro. In 2011, he composes the score for the silent film by Teinosuke Kinugasa « A mad page » 1926 which he interprets at the « festival of art history » in Fontainebleau. With Louis Sclavis and Jean-Paul Delore they have designed « Idioms and Lights » a recital based on French speaking authors (Michaux, Sony Labou Tansi, Dieudonné Niangona, Charles Beaudelaire…). Sébastien Boisseau also offers short duo programmes in « music lounges » where the host invites his friends and neighbours to discover the practice of improvisation at close range.